One minute’s glamour: True or False? “A solo exhibition, a published book, a marriage – these are my three wishes to welcome the big 4-0!” Jaffa Lam gesticulated as if she was rubbing the lamp to let the genie out. There was a sense of innocence. The first two wishes have been checked off earlier this year so her recent solo exhibition “I min. Glam” at Karin Weber Gallery seems like a bonus. What about the third? “It takes two to tango. I am satisfied with the present.” This outstanding wish has inspired a new theme, her would-be trousseaus. “It is this site giving me a sense of gentleness yet the fact of urban development. After seeing the antique furniture and the elongated floor plan in the gallery I decided to unleash her femininity. On the other hand, the monotonous street scene in this district (around Hollywood Road) has driven me away.” Businessmen know best about the property value of a corner bistro; women (and their other halves) know best about the price of a perfect diamond; the artist who admits her weakness at price-marking is very curious about the worthiness of her works. She then turned the gallery into a giant jewellery box. The new series consists of a heart-shaped diamond One Heart, a pair of brilliant cut diamonds Two Twinkles, a pair of jade drop earrings Two Blinks, a gemstone inlay Oval Chair, a gold-leaf plaque 1 min. Glamour. All oversized jewelleries mounted with quality stainless steel are made of crate wood. Jaffa never tries to disguise her proud material that gives her the sensual touch. 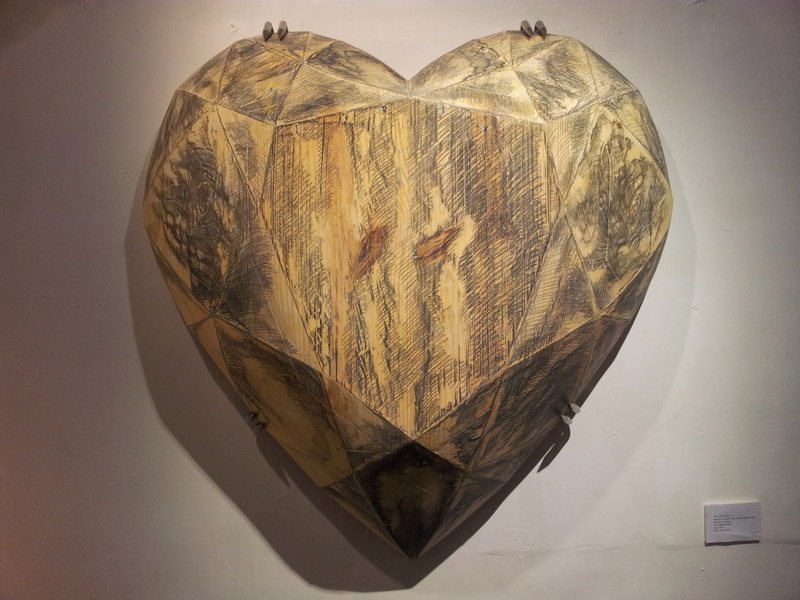 “I always want to be hugged (by artworks like mediation tent) but this time I really want to hug the huge heart. 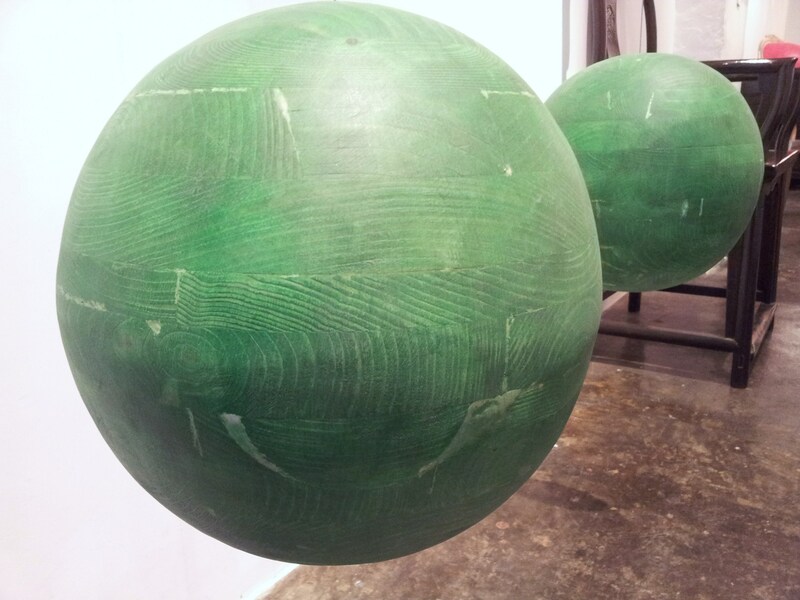 What’s more, holding the jade ball around my arms is like carrying an infant!” The artist starts to demonstrate a tint of motherhood in interpretation. The moment the word “motherhood” rang the bell, Jaffa was elated to show an ultraviolet torch, hopping to switch off all lights inside the gallery. “I painted a layer of substance… you see, the glamour appears. You see now [having switched off the torchlight], the glamour doesn’t last. Imagine the artwork is placed under sunlight or fluorescent; after the coating absorbs enough light, close the blinds or turn off the light. The luminescence would last a bit longer but still be gone quickly.” Jaffa found her way to question what an artwork is for to those who owned it. The title of the artist statement “If false make the true and true as well false” referencing The Dream of the Red Chamber may drop a hint: the main character’s name “Jia Baoyu” and “false gemstone” are homonyms. Thanks to advertising (not science) we have been told diamond is forever. However, in the eyes of the artist happiness is eternity. In spite of declines from galleries, funding sources and private collectors over the years, Jaffa keeps on pushing herself to lead a regret-free life. “I have a few more ideas about this series like ruby, citrine and sapphire, but I won’t rush. After all, I am carefree to do my projects.” Her most immediate wish is to sell a couple of artworks then she can plan a self-funded trip to New York at Christmas. Visited 1 min. Glam at Karin Weber Gallery on 12 Oct, 2013. The edited article was also published at a.m post, Nov 2013 edition.